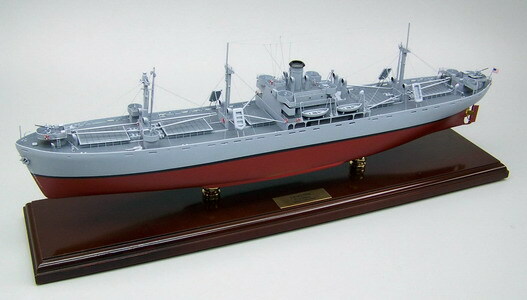 Liberty ships were cargo ships built in the United States during World War II. They were British in conception but adapted by the USA, cheap and quick to build, and came to symbolize U.S. wartime industrial output. Based on vessels ordered by Britain to replace ships torpedoed by German U-boats, they were purchased for the U.S. fleet and for lend-lease provision to Britain. Eighteen American shipyards built 2,751 Liberties between 1941 and 1945, easily the largest number of ships produced to a single design. The production of these vessels mirrored, on a much larger scale, the manufacture of the Hog Island ship and similar standardized types during World War I. The immense effort to build Liberty ships, the sheer number of ships built, and the fact that some of the ships survived far longer than the original design life of five years, make them the subject of much study. Mahogany wood. Scale: 1/192. Length 28 inches.